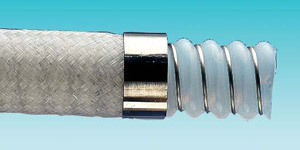 Corroflon is a unique convoluted reinforced PTFE lined hose offering better cleanability, drainability, and is fully kink and vacuum resistant at high pressures and temperatures. KYB Series is Kynar® Braided and used for the same reasons as the Hastelloy HB Series, but only in applications where the reduced pressure and temperature ratings of KYB are acceptable. Corroflon is the only PTFE lined convoluted hose on the market to be fully kink and vacuum resistant at high pressures and temperatures. This is because Corroflon's design incorporates a thick section external helical reinforcement wire which gives the radial support necessary to ensure maximum strength, whilst maintaining optimum flexibility and cleanability. The helix wire is welded directly to the end fittings at each end, ensuring security of attachment and electrical continuity. Corroflon is available in 3 liner types; General Purpose (GP), Black Anti-Static (AS), and Special Purpose (SP) where the convolutions are closer together, yielding greater radial strength to the hose design. See product literature for more information. Kynar® is a registered trademark of Elf Atochem.